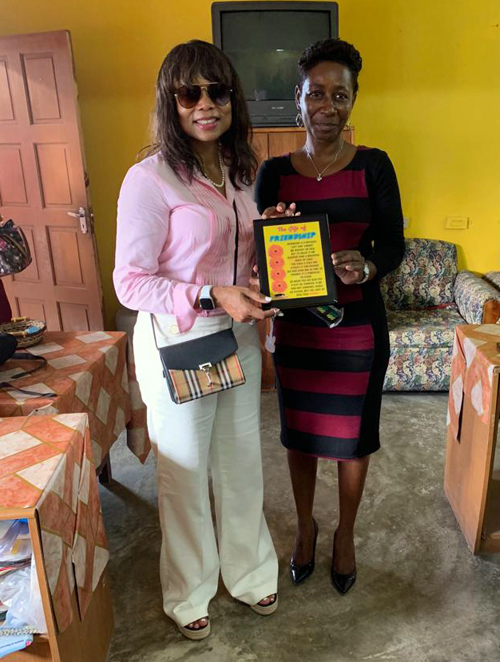 THANK YOU COTC: Children of the Caribbean Foundation (COTC) Executive Director, Rosie Hodge-Adams (left), is presented with a token of appreciation from Grade Three Teacher of the Salt Spring Primary and Infant School, Danna Allen, on behalf of the institution. The combined efforts of the United Nations and one of its charitable arms, the Children of the Caribbean Foundation (COTC), have resulted in the donation of numerous school supplies for two (2) of Montego Bay’s primary schools, which took place at each institution on Wednesday last week. Beneficiaries included the infant and primary departments of the Farm Primary and Junior High School and the Salt Spring Primary and Infant School. Over 200 students from both institutions received brand new knapsacks, pencils and scientific calculators to aid their educational endeavours. 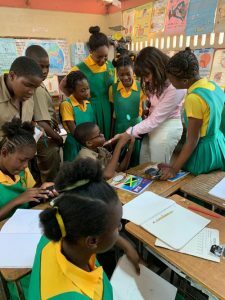 The outreach was part of an initiative to offer relief and assistance to deserving children across the Caribbean, as well as to gain an understanding of which areas needed development and support. LOVE AND HUGS: These two cuties of the Salt Spring Infant Department were all too eager to share a hug with COTC Executive Director, Rosie Hodge-Adams, who gifted them with backpacks and pencils. An update of the agro-based achievements of the Farm Primary and Junior High School was revisited. Over the years, the school has participated in several agricultural events, having won the JAS competitions and the LASCO Reap Rewards Programme, where they were placed in the top 20 in the island in 2015 and made the top 3 in 2016. Another issue related to the depleted farm, the chicken coop, wherein an excess of 100 chickens were raised every six (6) weeks and was heavily relied on to feed the entire student body, has deteriorated due to lack of funding and maintenance. Having depended on both avenues for sustenance, the school has resorted to outsourcing food, which has been costly over the years. ENCOURAGEMENT: Grade Six students of the Farm Primary School huddle around COTC Executive Director, Rosie Hodge-Adams, as she offered them words of encouragement. Here, they inch closer to hear what she has to tell Devoughn Bent (centre, seated). “We really hope that Children of the Caribbean can fund us so we may go forward for bigger and better things,” said Wallace. “The children are really enthused about it, especially the boys. They are always asking ‘Miss, are we going on the farm today?’” she continued. A native of the island of St. Kitts, Hodge-Adams underscored the commitment of COTC and their focus on education. “It’s always a pleasure to help out in any way we can. At Children of the Caribbean, we have a commitment and wherever there are children in need, we do our very best to assist,” she said. Hodge-Adams and COTC have pledged to continue to support Farm Primary and Junior High in order to help them to get back on their feet. Children of the Caribbean Foundation is a non-profit organization that focuses on the development of key areas in education, healthcare, social development and more recently, climate change in Caribbean countries.